ST. LOUIS, MO – Occupy Monsanto’s agents of change with the Genetic Crimes Unit (GCU) hung 13 large banners over highways throughout St. Louis this morning calling out Monsanto for their genetic crimes and highlighting the danger of genetically modified foods (GMOs). The GCU opposes Monsanto’s bid to increase spraying of food with toxic weed killers like 2,4 D (the main ingredient in Agent Orange). Occupy Monsanto is also alarmed that one company has control of nearly 90% of the US seed supply, giving it undue influence over what food people get to eat. GCU Agents know Monsanto has successfully lobbied against the creation of public policy that would otherwise be in place to inform consumers about GMOs they are eating daily. The banners hung today come after Occupy Monsanto banners began popping up across the Midwest last weekend over Interstate 70 in Ohio and Indiana. The banners hung today have messages including, ‘FDA is Genetically Contaminated by Monsanto’, ‘Genetic Biohazard: Defend Yourself,’ ‘The 99% VS. Mon$anto,’ and ‘Monsanto CEO = Millionaire; Monsanto Consumer = Lab Rat,’ amongst others. Each banner urges people to take part in Occupy Monsanto’s international call to protest on September 17, 2012, which is the one-year-anniversary of the Occupy Wall Street movement. Along with banners being hung on overpasses, one large banner stating ‘Mr. President Label GMO Foods Love Michelle‘ was staked onto the front lawn of Monsanto’s global headquarters. Photographs and more specific locations of banners on the overpasses will be posted at Occupy-Monsanto.com as well as info on the worldwide day of action in September. Members of the media are free to use these images compliments of the 99%. “Today’s action is part of a larger movement to stop genetically modified foods. Last Friday protests of Monsanto were held in over 30 cities throughout the US and in places all over the globe including Spain, Germany, New Zealand, Australia, Japan, and Canada. In Davis, California 150 people shut down a Monsanto facility and today Monsanto has felt the first impact of the Occupy Monsanto movement in their home city of St. Louis. To date more than 990,000 people have signed onto the www.JustLabelit.org citizens’ petition to the Food and Drug Administration for GMO labeling (the most to sign an FDA petition ever). Last fall over 100 people marched in the Right2Know March from New York to the White House to demand President Obama keep his campaign promise to label GMO foods. Video of the promise can be seen here: http://www.youtube.com/watch?v=zqaaB6NE1TI In California Monsanto faces a 2012 ballot proposition on GMO labeling. Today Monsanto was given a warning; on Sept. 17, 2012 Monsanto will be occupied in hundreds of locations internationally. Visit occupy-monsanto.com for more information. 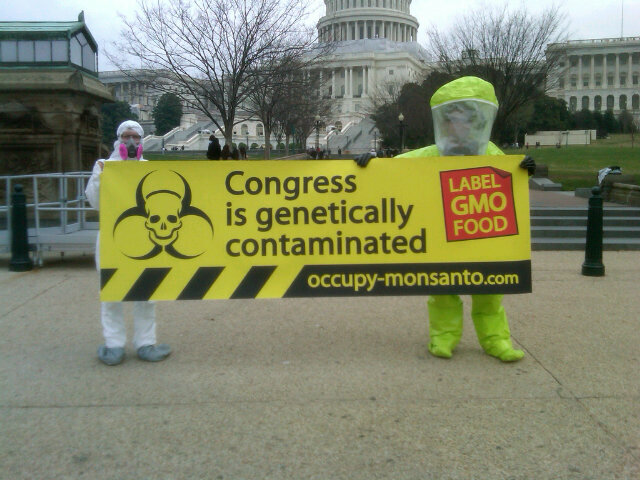 Today Genetic Crime Unit Field Agents descended upon the U.S. Capitol to visit a genetically modified Congress. 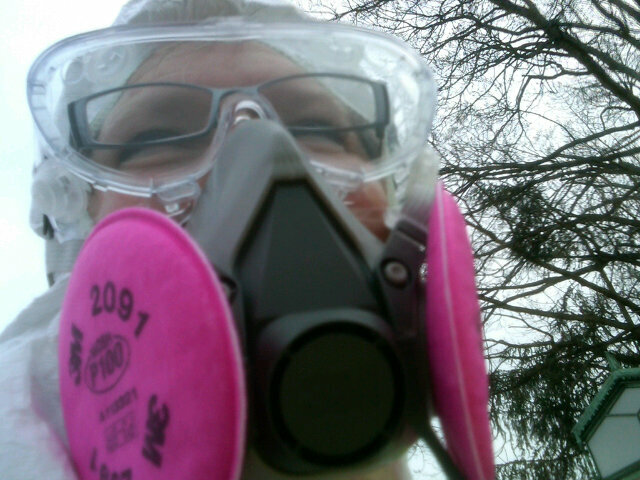 Do you have photos from today’s global action against Monsanto? Please send them to GCU@occupy-monsanto.com! 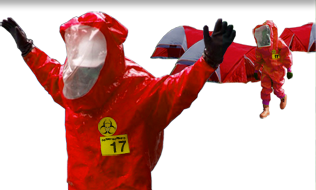 WASHINGTON DC – On Friday, March 16, 2012, Occupy Monsanto’s agents of change with the Genetic Crimes Unit (GCU), a group designed to protect America from genetically modified foods, will wear bio-hazmat suits when they visit Congress. The group will gather at Capitol South Metro station at noon on March 16 to highlight how chemical company Monsanto is contaminating our political process. The GCU opposes Monsanto’s bid to increase spraying of food with toxic weed killers like 2,4 D (the main ingredient in Agent Orange), genetic contamination of the organic food supply, and other risks associated with genetically modified food (GMOs). The GCU will arrive at the metro station wearing bio-hazmat suits to assess whether Members of Congress and their staff have been victims of genetic crimes. The GCU will hold a banner that reads, “Congress is Genetically Modified,” as they circulate on Capitol Hill sidewalks. This day of action is part of a larger international call to ‘Occupy Monsanto’ taking place all over the globe including Spain, Africa, New Zealand, Australia, Canada, and at least 28 cities throughout the US. “In the name of Wall Street profits, chemical corporations such as Monsanto genetically engineer crops to withstand high doses of their toxic weed killers that contaminate our food and water, and have not been proven safe. We deserve to know what we are eating. Virtually every major country requires labeling of GMOs in foods so their citizens can make informed choices, including all of Europe, Japan and even China,” said GCU’s Angela Johnson. “Monsanto’s lobbying dollars are pouring into politicians so its clear we have a GMO contaminated US Congress that threatens our health and the health of the planet,” says Vegosen. Shut Down Monsanto and the Anti-Monsanto Project are calling for global days of action to shut down Monsanto on Friday and Saturday March 16 & 17. Click here to view the Global Call to Action. Click here to find the Monsanto location nearest to you! 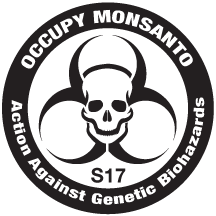 If you can’t make it to the protests in March, stay tuned for Occupy Monsanto, September 17, 2012.